We use different kinds of jewelry in everyday life. Besides Gold, Diamond etc. precious gems, we use silver, gold plated, metal, stainless steel etc. made jewelry also. These items can be damage quickly. For protecting them, we have to take care of them properly. 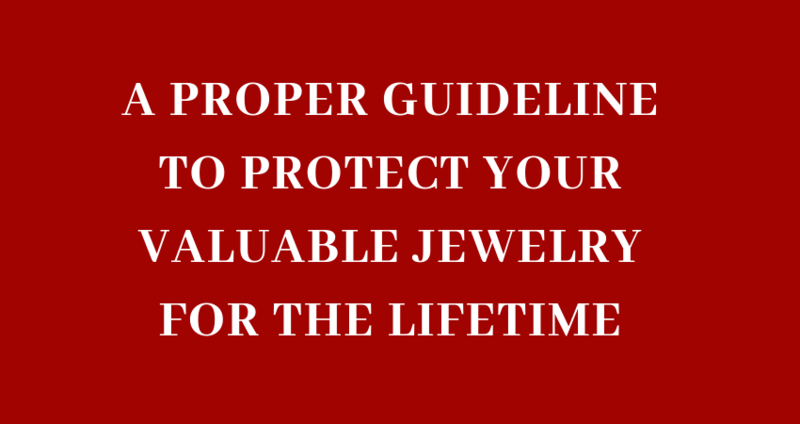 Do you know how to protect jewelry from different types of bad situation? Usually, we take care of valuable metals but everyday jewelry damage early. The reason is very simple. First, we should know what we mean everyday jewelry. You can call Engagement, or Wedding rings everyday jewelry. It can be any kinds of metals as diamond or gold or anything. What we wear regularly are known as everyday jewelry. Generally, we use less valuable metals as everyday jewelry. We should care for everyday jewelry more than precious metals. How to Protect Jewelry for Lifetime Use? What Do We need to Do at Home? What Do We need to Do at the Workplace? It is possible to protect all valuable ornaments for lifetime use. For that, you should follow some rules and avoid some things. Do you know what you need to do? Maybe yes or maybe not. Whatever, here is the guideline you need to follow to preserve these gems for the lifetime. You will found different kinds of the jewelry box in the market. It is not so important what types of materials used for making it, only important its capacity. If you don't have a budget, you can make your own jewelry box with a paper by yourself. If it can keep ornaments safe than it is enough. I use separate soft bags in my jewelry box. I do it, so that doesn't scratch each other. Every metal especially diamond can easily scratch other diamond. If you wear pearls often, use them carefully. They are soft so store them in a soft bag. Check your precious jewelry and its stone minimum once a year. Here is the guideline to store your jewelry: How to store jeweler? You should clean your every ornament after every use. If you follow our blog, you may know already about two kinds of jewelry cleaner. Check our suggested 15 best ultrasonic jewelry cleaner reviews and buy the best suitable one for yours. If you wash it regularly, you should able to use it for a long time for sure. If you like to avoid ultrasonic wave, steam jewelry cleaner is the best alternative for you. But whatever you want to use, you should keep your jewelry clean for sure. We suggest you not to wear the rings while you work on garden, clean your house or work in the kitchen. It will dirty and damaged. Rings frequently fall off and get lost while gardening. Similarly, we said not to wear rings while cleaning because cleaning solvents are tough on metals. Your diamond can be lost its brightness by cleaning solution. Don't wear rings or other body jewelry during Gym. It has some apparent reason because the seat can make an allergic reaction on metal. It is also harmful to your skin. It is far better if you avoid wearing jewelry during any kinds of physical work. Are you wear your rings at work where you are involved in physical labor? Don't do it. One wrong angle at a hard surface can scratch a diamond stone or damage the metal. If you wear the jewelry in a hot tub, the chlorine can affect the metal. Not only that, don't wear it during swimming. Because if shrinking body can cause the ring to slip. Generally, we found guys lost their earrings frequently. So you should avoid wearing any kinds of ornaments during swimming. One more important thing. In general, people wear less precious metals in their regular life as gold plated or stainless steel. These items can be damage early. Even you cannot apply all types of cleaning process to clean these metals. You can read this guideline for understand How do you clean stainless steel jewelry? You cannot use anything in a continuance. One day everything will damage. We only can have a try to use our favorite item as long as possible. By taking proper care we can use jewelry for a long time. The fact is that, do I apply the right process? In this article, you are getting more than enough resource so now you know how to protect jewelry. Hope you will follow these.